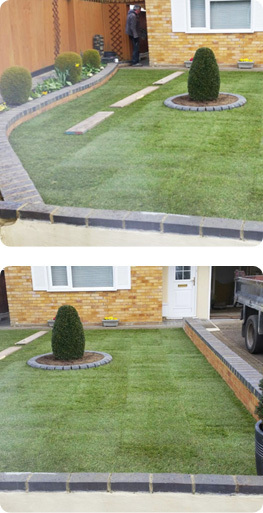 Garden designers and landscaping contractors in Ruislip. From concept and planning through to completion, our experienced team here at A&E Garden Construction can visualise your gardens’ full potential and bring it to reality. With our expert machinery, knowledge and know how in the landscaping industry, we can transform your garden into whatever you dream of. Whether you are looking for a new block paved patio, a striking new lawn or simply want to discard of some garden rubbish to make way for seating or beautiful water feature, our team are at hand to make your dreams become a reality. Having a well landscaped garden can add charm, interest and kerb appeal to any home whether you are looking to sell your property or stay put. It can also add extra living space and add value so call in the experts today to discuss your thoughts. Our experienced team here at A&E Garden Construction are happy to offer free helpful advice and guidance on any aspect of garden landscaping and design in the Buckinghamshire, Middlesex, Hertfordshire and West London areas. We offer free no obligation quotations and come fully insured. To book your free home visit call our experts today on 01895 675941. Tired of looking out of your kitchen window and seeing a drab lifeless lawn? Call in the experts at A&E Garden Construction and let us bring life back into your lawn and garden. We use only the best turf on the market and strive to give our customers 100% satisfaction whether you are looking for an entirely new lawn or just need some help on problem areas. We also can deliver topsoil, chippings and mulch! Call our friendly team today for help and guidance and to discuss your requirements on 01895 675941.